If your walls are looking a little basic, you may be inclined to grab some prints or photos and hang them up—but we think you can do better than that. Have you considered a mural? A wooden wall? Or even a ladder? There’s a ton of ways to make your wall art actually interesting, so your bedroom doesn’t look like literally everyone else’s. If you’re afraid of committing to a printed wallpaper, choose a neutral color. Your wall will still stand out, but the room will feel much lighter. Rather than wasting limited inches on mounting a headboard, turn your wall into a headboard, like wooden statement wall. Your bedroom should be the coziest room in your house, so take it there with a soft, knit wall hanging. If you’re going with a boho aesthetic, it’s a must-have. Even though it’s not technically hanging on your wall, it still counts as wall art. Prop a ladder up against your wall for a rustic accent that also comes in handy for hanging extra towels, blankets, or scarves. You don’t need to clutter your walls with art—a single, medium-to-large-sized hanging can still be impactful. Cool, minimalist vibes for days. You don’t have to disrupt clean, painted walls with hangings—instead, paint a pattern. You can cover your entire wall for more impact, or limit the design to a small section. 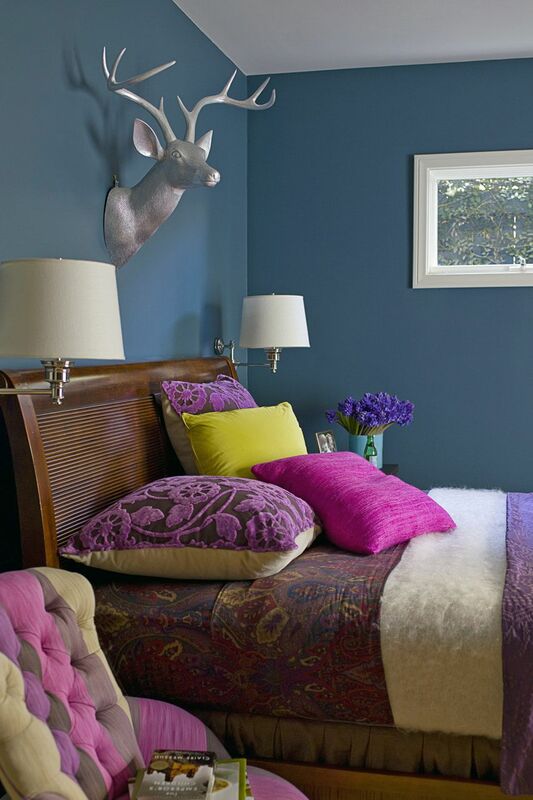 Antlers can be rustic, hipster, or even glam (yes, seriously) depending on how you style them. Choose a metallic version and pair with jewel tones and you’ll be surprised how chic they can look. Vintage posters create a bold alternative to a headboard in the master bedroom. They also help add some color.